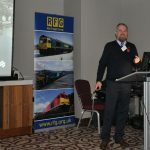 Rail Freight Group held a Scottish breakfast meeting in March which covered a wide range of topics with a free-ranging discussion by all attendees, including RFG members and representatives from Transport Scotland, ScotRail Alliance, Transform Scotland and Caledonian Sleeper. In general, it was agreed, the policy context in Scotland is good, and that the support of Government is creating a good environment for the sector. The existence of the Scotland Freight Joint Board including its five workstreams within the HLOS Action Plan, is evidence of that; it is looking to improve quality, accessibility and affordability. There have also been rail freight commodity workshops with CILT and FTA in Coatbridge, Aberdeen and Inverness which have been very helpful. The meeting was told that 40% of Scotland’s transport budget is spent on rail [including the ScotRail franchise] but that is not reflected in market share in either passenger or freight, so it can be a difficult task to argue for more investment. However, the environmental and economic benefits of rail freight continue to help support investment and policy. It was noted that the road maintenance team is reportedly keen to see freight shift to rail and this benefit prompted everyone to agree that we need to be better at promoting overall benefits of rail freight in reducing pollution and congestion as well as wear and tear to the roads. The question of grants and subsidies was raised. Are they the best route to creating a sustainable and competitive rail freight industry? The FFG budget is not being fully spent and there were some suggestions on why that may be. It was also noted that in some cases it can take a the long time it takes from concept to launch – which means the potential customer/FOC has given up before the process is completed. Everyone agreed that sometimes the pace of change can be too slow – longer loops en route to Inverness and Aberdeen being a case in point. Also, we need to remember that development of new freight flows is not always about the main line, as shorter links for terminal connectivity can be just as important. Attendees agreed that Network Rail needs to see itself in a business development role for rail freight, not in just a facilitation role. 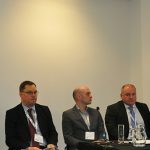 One delegate said: “I never again want to hear a Network Rail route manager saying that ‘freight is not my job’.” Network Rail, both in the Alliance and FNPO could play an important role in early market development. One participant suggested that Government and FOCs /customers can pay a lot of money to improve the gauge and then find that is not maintained. This highlighted the need for a transparent, maintained freight gauge for Scotland, a move which would be strongly supported by the sector. In answer to the question, ‘does devolution of NR work?’ participants agreed that the needs of freight often start at a local level, so it is good to have local understanding of issues and local control of measures to resolve them. However conversely, it was noted that cross-border alignment between routes can be an issue for instance there can be a lack of synergy and communication between NR Routes over how possessions are planned, and new capacity on cross border routes is challenging. The emerging framework in Scotland, with freight targets for the Alliance aims to help manage devolution for freight and appears to already be working. It was suggested that there should be something in place at a working level to preserve the timetable, look at capacity issues etc in a constructive way and engage with the wider rail community, and there was an agreement to progress options for this. There was a discussion about the need for future investment from Government and the private sector. For customers, there is some lack of clarity from Government about the ‘right type of third party investment’. It can be a problem if one party makes an investment that also benefits other parties – it is very difficult to get those other parties to pay their share. So the investment is not made at all as it becomes uneconomic. 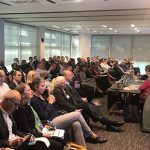 Attendees agreed that it is easier to make case for investment to get from 23 to 25 passenger services than to build a case starting from zero for freight, so customer support for new flows is important. It was acknowledged that attracting new business and then delivering fast, reliable services within a short time is very challenging. So much commitment and preplanning is required to get the first train moving that many people give up. Participants agreed that there is scope for Transport Scotland to pump-prime initial train service as sometimes you need to start a service so that people can try it and then you will get critical mass. The interaction of this with existing grant schemes needs to be considered. The FOCs are working on very small margins so business development can be stretched, but, as one participant argued, the rail freight industry needs to get beyond the metal and look at sharing resources (as road hauliers do: see it as a logistics business, not a rail business). Everyone agrees that traffic cannot grow if the paths are not available at a suitable time. For instance, when running out of ports, you need to ensure that services are suitably timed across the day to give customers more options and choice, but network constraints do not always enable this. One participant pointed out that the growth of rail freight is not just about winning freight from road. Shortsea feeders are also competitors. This is made more difficult as shipping lines subsidise feeders, and European ports are owned by their governments. The concept of using existing passenger rolling stock to carry freight was raised. There is a fixed cost to maintain the rail network so anything that increases traffic/income is to be welcomed. We used to have parcels carried on trains, especially to more remote areas, so why not revive that? The meeting was told that there is nothing in the franchises that is an obstacle to that and that the lower marginal costs would reduce risk of starting a new service. The concept has been proved in England with hi-value medical samples from East Midlands to London and fresh produce from Cornwall to hi-end restaurants in London. In Switzerland, you see timber wagons connected to back of passenger trains. The Scottish Government is receptive to hearing more suggestions for ways to increase the use of rail to transport freight, both internally and cross-border. The Scotland Freight Joint Board is a welcome body, but we need to continue to look for more ways to communicate across the rail industry – and within the logistics industry. We also need to be better at promoting the benefits of rail freight to the wider public (the voters) to encourage more investment and acceptance of rail freight services.